Reaching retirement is an exciting thought, so you likely already have this blank filled in—possibly with more than one answer. Maybe you envision spending your golden years on a sunny beach or in a new country with plenty of adventures waiting to be had. Regardless of what your future retirement looks like, one of the biggest things standing in your way is time; you just have to reach retirement first. And at what age will your official retirement begin? If you live in America, the answer to that question is likely age 62—which a recent study by Gallup found is the average age at which U.S. workers report retiring . However, many retirees don’t plan on retiring that soon. In fact, the same study reported that most workers expected to continue working until age 66, which is the highest expected retirement age reported since Gallup began asking the question in the early 90’s. With the average expected age of retirement on the rise in America, we began wondering where age 66 falls in comparison to other countries. And we found that depending on where you live in the world, the average expected age of retirement can look vastly different. So where in the world are people retiring the earliest and in what countries are workers delaying retirement? 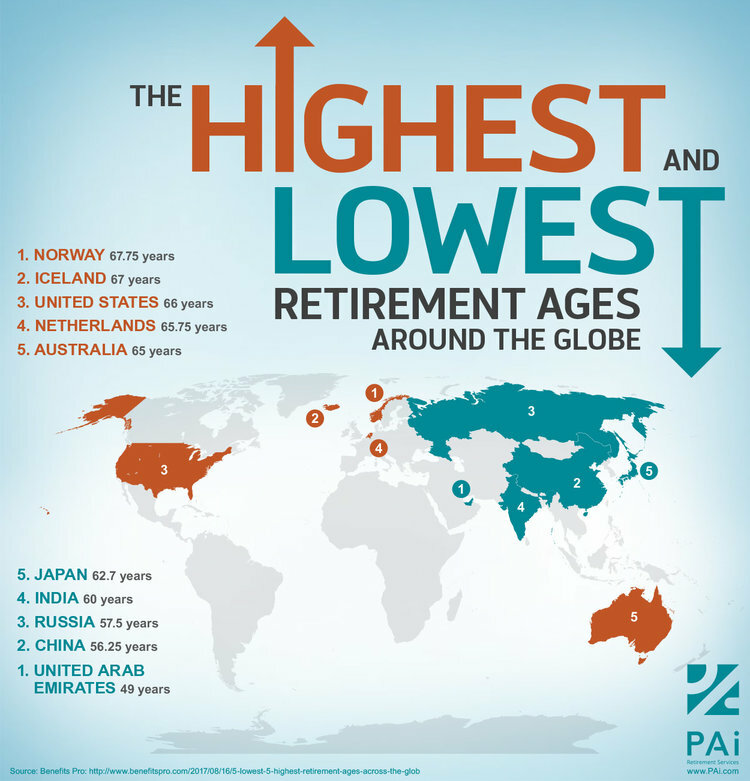 As we can see above, America falls at the high end of the spectrum when it comes to average retirement ages. The natural next thought then becomes, “Well, what can I do to retire sooner?” Preparing for an early retirement isn’t always easy; if it was, everyone would do it. However, there are a few simple steps you can take that just may help you become retirement ready a little bit sooner than your more lackadaisical counterparts. Understanding all of the various aspects of finance can be difficult, so it comes as no surprise that 8 in 10 adults agree that they could benefit from advice and answers to everyday financial questions from a professional . Being more in tune with your own understanding of credit scores, investments, risk management, and the like may help you make better decisions with your money in the long run. Written financial plans not only point savers in a general direction, but they also provide clear goals and actionable steps savers can take to work towards those goals. And the benefit of written plans is clear—according to a study conducted by the Aegon Center for Longevity and Retirement, savers with a written retirement strategy are significantly more likely to turn their good intentions into actions . Obviously, if you want to retire early, you need to be on top of your savings game. Cut out any unnecessary expenses, like that daily coffee from your favorite chain, and commit to saving as much of your disposable income as you can. If you have access to an employer-sponsored retirement plan, begin contributing as soon as you’re eligible. And max out the account if you’re financially able to do so to for the largest long-term balance. Saving for a retirement is no small feat. It takes dedication, perseverance, and discipline—but we think the reward of a financially free future is worth the effort. Let’s talk about ways we can help you reach your retirement goals. Contact us online or give us a call at 800.236.7400, option 1. Newer PostWhy are there so many recent lawsuits about excessive 401(k) fees? Older PostIs your 401(k) looking out for you?